An aside: The opinion I express is this column is somewhat contentious. In a recent twitter exchange on the subject I was informed by an esteemed whisky writer that I was “just plain wrong”. The why was, and still is, not as clear. In the interim thus this presumably snot-nosed, impudent upstart of a whisky blogger stands by his opinion. I’m often guilty of looking at the whisky world through rose-tinted glasses. I am after all a self-professed whiskyphile, so a certain extolling of the virtues is part of the job description. My natural inclination is to be mostly positive. The reality however is that whisky is a human endeavour, and, like any other, is prone to human failings. A cast which includes moonshiners, bootleggers, smugglers, gangsters, and all manner of dodgy bastards, have featured prominently in its story, a story whose aspect has been transformed – by the passage of time, and by subsequent regulation and legitimisation – from criminal to colourful. Today a few huge conglomerates dominate production. The industry is seen as venerable, and its members as responsible corporate citizens. But are things really as proper as they appear? I wouldn’t be self-respecting if I didn’t blend my admiration with a dash of scrutiny. Marketing – if one was to adopt a cynical stance – is akin to commercial propaganda. The discipline, in somewhat Goebbels-esque fashion, is no stranger to large-scale institutionalized deception. In the marketing of whisky one of the more insidious examples, in my opinion, is the so-called No Age Statement (NAS) whisky. The age, or to be more accurate (and lyrical) the duration of maturation, of whisky is a subject of lengthy debate. To avoid labouring the point, let’s just conclude for our purposes that age is of distinct importance to the whisky drinking public. Research published by Chivas Brothers last year revealed the following actualities: “94% of consumers believe the age statement serves as an indicator of quality” and “93% believe that older whiskies are better quality”. It follows then that people expect expensive whiskies to be old – since one expects to pay for quality. As the whisky market has boomed beyond forecast over the last three decades, suppliers have struggled to keep up with the demand for older stock. This crisis has been to some extent remedied by the proliferation of the multi-vintage whisky – a blending of old and young whiskies. In itself this was a tidy “innovation” (these had existed before but as an exception) presenting whisky lovers with an extensive new diversity of flavour and style, and stretching the dwindling quantities of older liquid. There was however an accompanying dilemma – Scotch Whisky regulations require that any age claim must refer to the youngest component in a whisky. 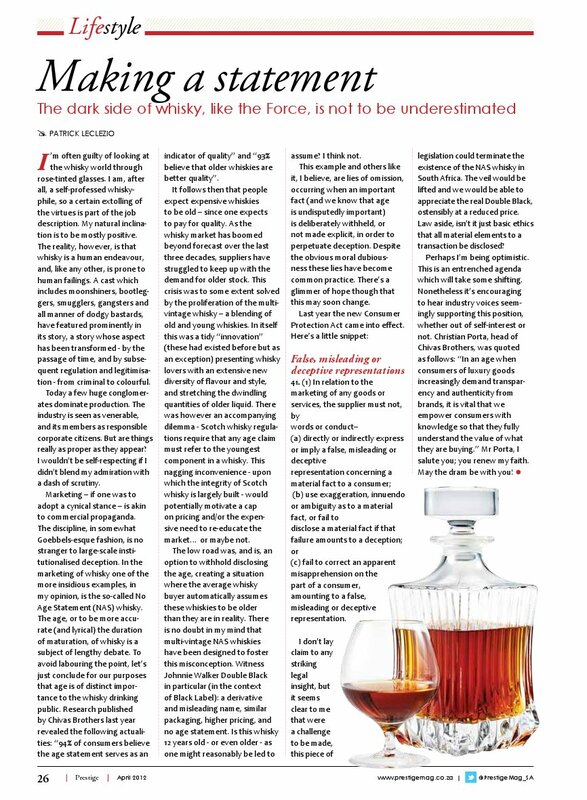 This nagging inconvenience – upon which the integrity of Scotch whisky is largely built – would potentially motivate a cap on pricing and/or the expensive need to re-educate the market…or maybe not. The low road was and is an option to withhold disclosing the age, creating a situation where the average whisky buyer automatically assumes these whiskies to be older than they are in reality. There is no doubt in my mind that multi-vintage NAS whiskies have been designed to foster this misconception. Witness Johnnie Walker Double Black in particular (in the context of Black Label): a derivative and misleading name, similar packaging, higher pricing, and no age statement. Is this whisky 12 years old – or even older – as one might reasonably be led to assume? I think not. This example and others like it I believe are lies of omission, occurring when an important fact (and we know that age is undisputedly important) is deliberately withheld, or not made explicit, in order to perpetuate deception. Despite the obvious moral dubiousness these lies have become common practice. There’s a glimmer of hope though that this may soon change. I don’t lay claim to any striking legal insight, but it seems clear to me that were a challenge to be made this piece of legislation could terminate the existence of the NAS whisky in South Africa. The veil would be lifted and we would be able to appreciate the real Double Black, ostensibly at a reduced price. Law aside, isn’t it just basic ethics that all material elements to a transaction be disclosed? Perhaps I’m being optimistic. This is an entrenched agenda which will take some shifting. Nonetheless it’s encouraging to hear industry voices seemingly supporting this position, whether out of self-interest or not. Christian Porta, head of Chivas Brothers, was quoted as follows: “In an age when consumers of luxury goods increasingly demand transparency and authenticity from brands, it is vital that we empower consumers with knowledge so that they fully understand the value of what they are buying.” Mr Porta, I salute you; you renew my faith. May the dram be with you! This entry was posted in Whisky column and tagged Johnnie Walker, Prestige Magazine, Whiskey, Whisky. Bookmark the permalink. Outstanding, Patrick. No doubt the controversy will continue and you will be both vilified and held as a hero. As long as there is whisky to drink, the debate continues. Thanks Bernard. We must catch up soon and have a celebratory dram with Marsh. Thanks for the comment Richie. I have no doubt that they have an agenda – but in this instance at least they’re saying the right things on the record. This process looks interesting, albeit very technical. I’m not familiar with it at all. What’s the end result for flavour? As mentioned I’m completely unfamiliar with this process so out of my depth commenting on it. You’ve got me interested though. I know some people at Chivas Brothers so I’ll work it into the conversation next time I see them in Scotland. An ex-Chivas employee tells me that Chivas have recently stopped recording the remaining “maturation potential” of casks so their claims of age as a guarantee of quality does not stack up IMHO – time will tell!! Ageing is an incendiary topic, for sure. I think that any statements on the subject need to be qualified. For instance I can credibly claim that age and quality have a proportional relationship, as long as I qualify it with: up to a certain point, and on a like-for-like basis. Obviously an inferior make, poor casks, and/or sub-optimal ageing environments will inhibit the benefits of maturation, but, if you’ll allow a rugby analogy, whilst a small, talented guy will be a better player than a big, untalented guy, a big talented guy will almost always be better than a small, talented guy. I found this analysis by Serge Valentin to be really interesting: http://www.maltmaniacs.net/E-pistles/Malt-Maniacs-2010-04-Does-the-age-of-Scotch-whisky-matter.pdf. Check it out, and may the dram be with you. You’re right, but given the size of his sample my gut feel is that a statistiscally sound analysis would support his conclusion. I also totally agree that age does not by any stretch of the imagination guarantee quality. This Chivas campaign is without a doubt self-serving – but it makes certain valid points. Primarily: people believe age to be important, so it should be disclosed. If people believe leather car seats to be important, car manufacturers should disclose whether their seats are made from leather and the proportion thereof. They should not intimate that more leather has been used than is actually the case, irrespective of whether or not leather guarantees a better quality seat. This is the basis for an ethical transaction. I think that this very disclosure will be educational in itself, and will start changing people’s attitudes towards age. Greater transparency in my opinion can only be a good thing. I’ll be watching with interest. Thanks for your stimulating comments Richie. Hi Patrick. Good read as always. I feel the age thing is being blown out of proportion. If you ask the average whisky drinker, yes, age is important. But most of them do not even know what it means, nor do they pay much attention to it. Also, because they think it is important, doesn’t mean it is. I’m sure you would agree that older doesn’t necessarily mean better. I have no problem with NAS whiskies, and the reason it is being employed more and more is to allow flexibility with diminishing stocks but increasing demand. What I don’t like is being charged 30yo prices for an NAS. Thanks Marc. Agreed – just because consumers think older is better doesn’t in itself mean that this is the reality. However there is firm evidence to suggest that age is important to consumers in making their purchase decision, and this needs to be respected. I too have no problem with multi-vintage whiskies, many (most?) of which are very good, except where the fact that they’re NAS is being used to justify an excessive margin (which is often the case). If consumers are given more information, not less, the multi-vintage concept will be better understood, and it’ll become apparent gradually to more and more people that older doesn’t necessarily mean better.